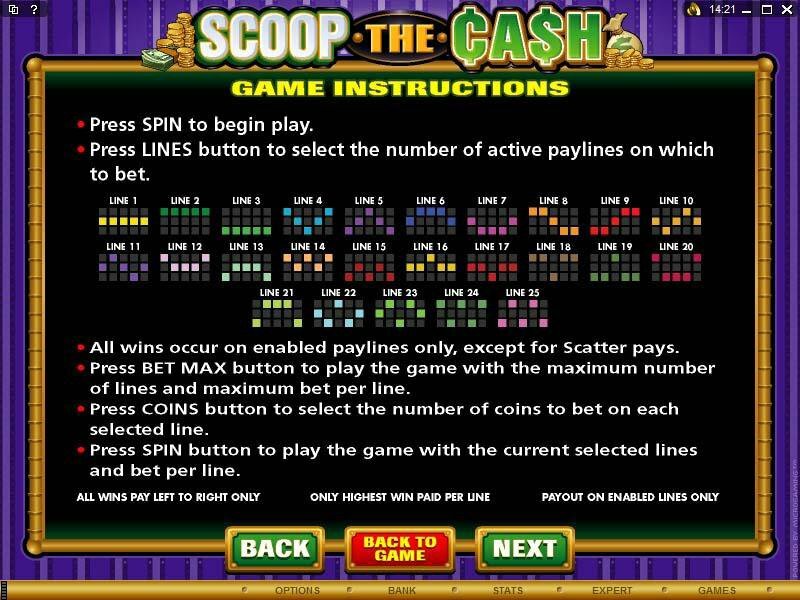 Overview: This game is all about rewards as the player is invited to SCOOP THE CASH. 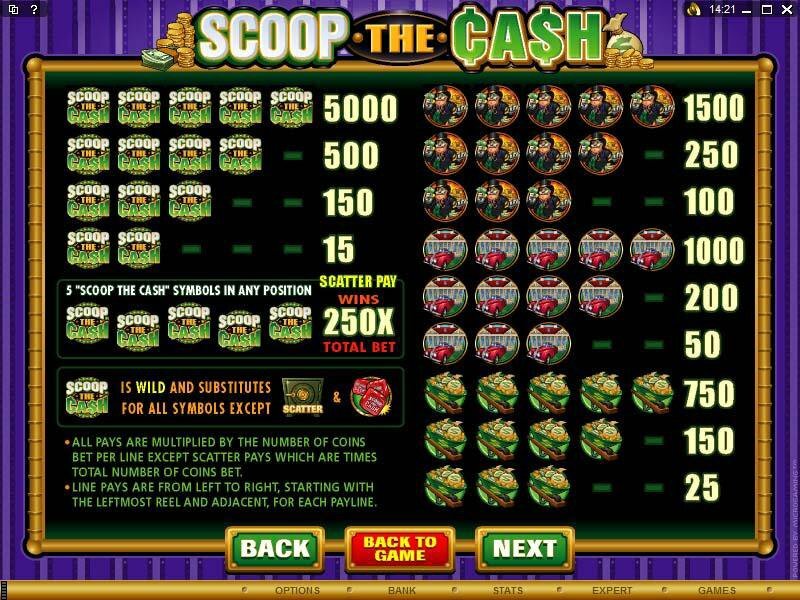 Multipliers in abundance await at different stages of the game, and re-triggering Free Spins, Wilds, two Scatters and a fat bonus add that important element of excitement and entertainment as the game unfolds. The theme has a game show feel, with icons of wealth and success like luxury cars, mansions, cashed up tycoons and wheelbarrows overflowing with lovely lucre. 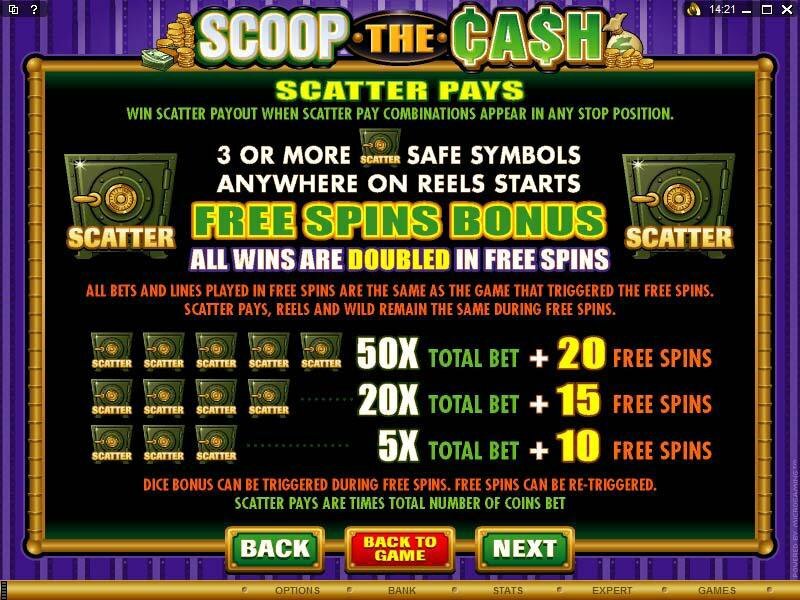 Two sets of Scatters help create player wealth; in the first, 3 or more safes anywhere on the reels starts the Free Spins Scoop the Cash feature, in which all wins are doubled. 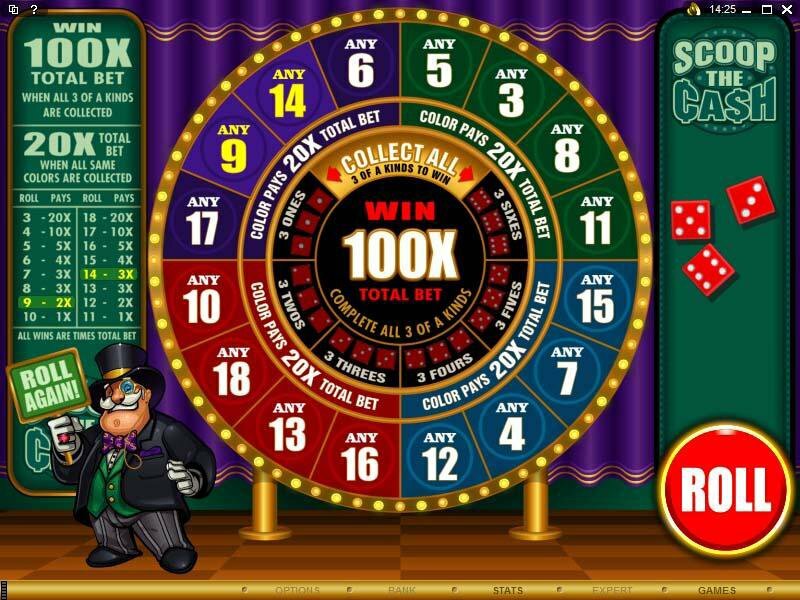 Rewards come in the form of multipliers on a sliding scale: 5 safes will generate 50x total bet and 20 free spins; 4 safes will deliver 20x Total Bet and 15 free spins and 3 safes gives the player 5x Total Bet and 10 free spins. 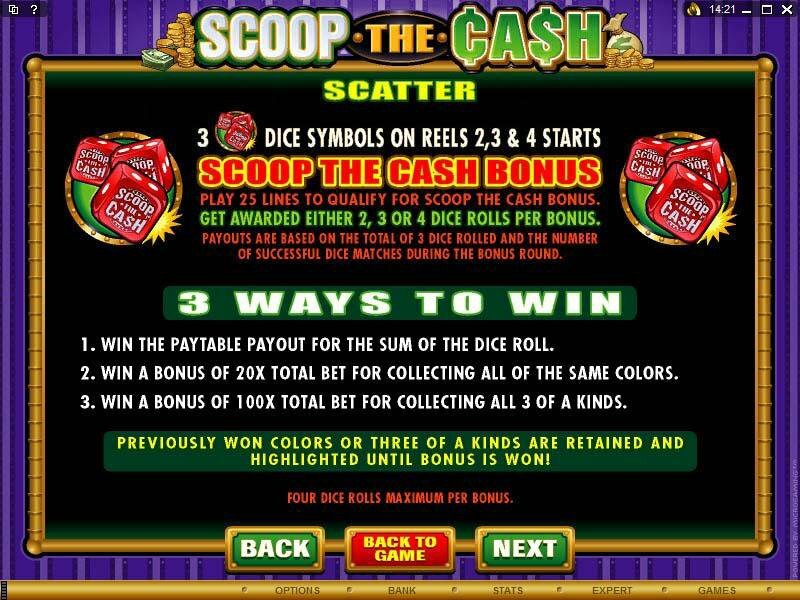 The second Scatter comes in the form of Scoop the Cash Bonus dice. 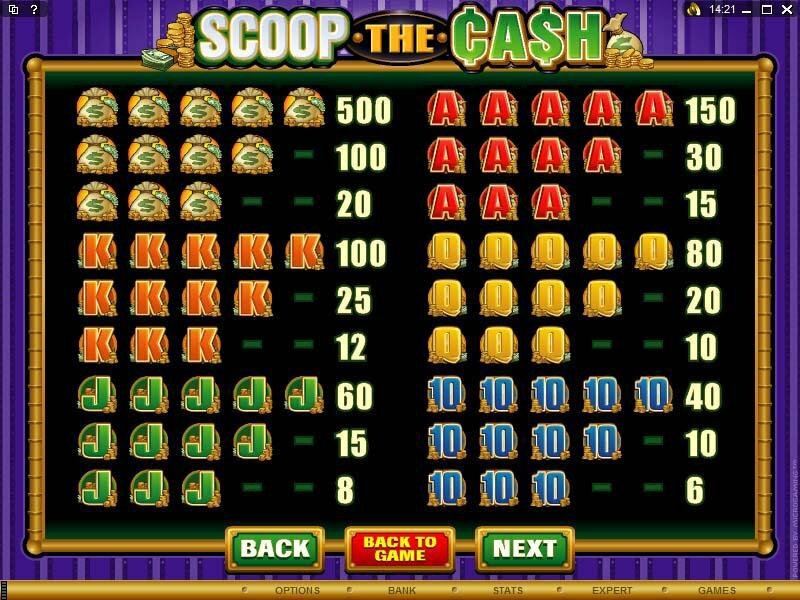 Here, the Dice symbol across reels 2, 3 and 4 starts the bonus feature, which offers three different ways to win: a pay table payout, 20x total bet on completing same color group on the wheel, or a hefty 100x total bet if 3 of a kind are completed. Players can roll the dice a maximum of 4 times per bonus, and the reward is persistent, meaning that rewards already achieved on earlier rolls are retained until a color group or 3 of a kind group bonus is won. 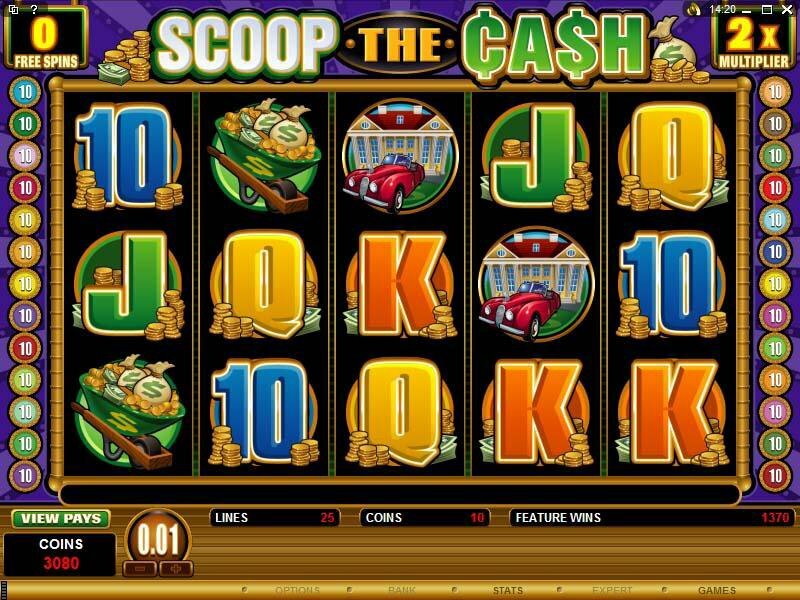 An added benefit is that the Scoop the Cash Bonus can be triggered from within Free Spins. 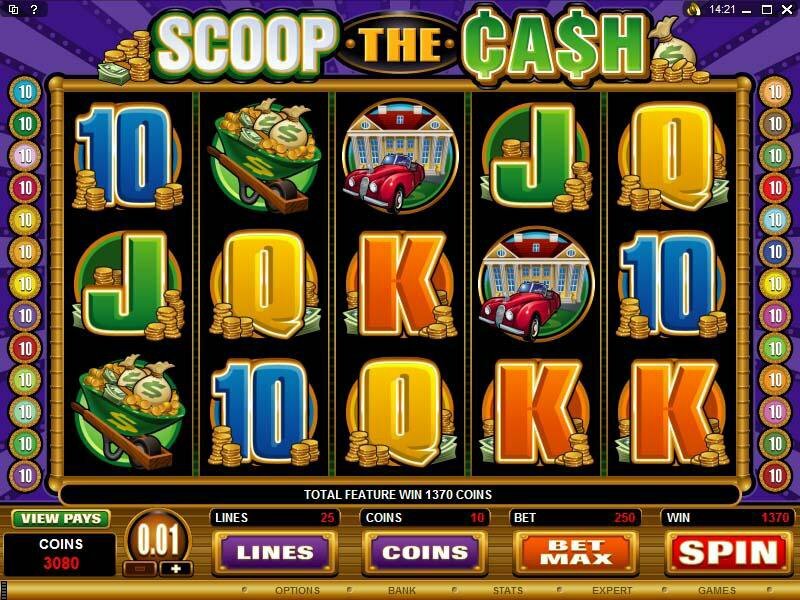 Similar Slots: If you like Scoop the Cash, you might like these other 5-reel slot machines: Dolphin Tale, Kings and Queens, Monster Mania, Summer Holiday, Sure Win, Witch Dr..